If you are a fan of Running Man, you must have been waiting for October 19 to come as soon as possible. Now, you are just hours away from meeting HaHa, Kim Jong Kook, Jee Seok Jin, Kang Gary and Song Ji Hyo. This is the first time Ji Hyo joined the other casts for the Fan Meet. It is not a surprise that the Monday Couple comprising of Ji Hyo and Gary, were the hot topic during the press conference. Recently, there was a scene where Gary plucked up the courage and kissed Ji Hyo on her cheek. Everyone was so impressed and proud of HAHA. When asked about the kiss, Ji Hyo was really shy about it. She then confessed that it was a good kiss. Gary on the other hand explained that at that moment, he was a little crazy. Aww Gary, you don’t need to hide. Not only loud cheers were heard from the Running Man casts and the media, standing ovation from HaHa, Jong Kook and Seok Jin! Being the only female cast in Running Man makes viewers wonder what it is like to be competing against the hunky and strong man. Ji Hyo admitted that it is definitely different but revealed that the other casts do not treat her as a lady. She added that it does not matter if you are a man or woman, it is all about being part of the Running Man’s family. Jong Kook and HaHa interrupted her and said that she is not a woman and at times, Jong Kook added that, Ji Hyo is stronger from them. You go girl! Fans who will be attending the Fan Meet later can expect a lot of fun. HaHa hopes that the casts will be able to engage more with the fans. Seok Jin revealed that there will be a performance by the Monday couple, HaHa and Jong Kook. Ji Hyo added that the cast have put in a lot of effort for the show and hopes that everyone will enjoy it. The Running Man casts are really appreciative of the love and support that has been rendered to them. Gary promised that the cast will keep improving themselves. 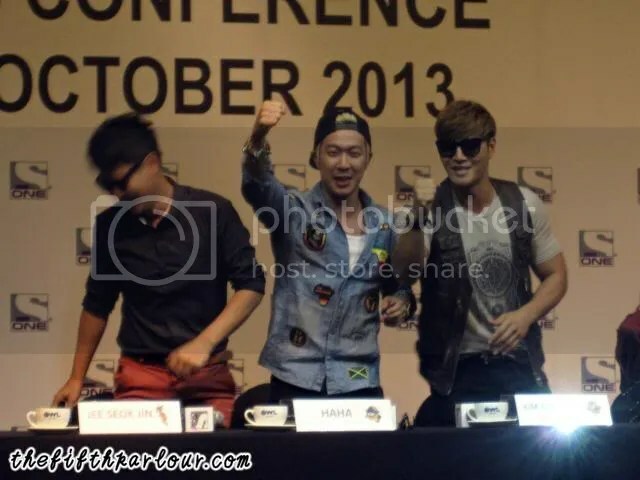 Jong Kook and HaHa will always have Singapore in their hearts! Seok Jin hopes that they will be able to film Running Man in Singapore against the Singapore Flyer. I am sure everyone agrees to his suggestion. Thank you ONE for extending the invitation for the press conference to The Fifth Parlour!